When finished, it will be the best dwelling house in the state, except that of Monticello; perhaps preferable to that, as more proportioned to the faculties of a private citizen. – Thomas Jefferson, 1812. 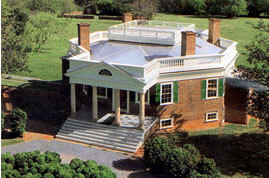 Jefferson was speaking of his home near Lynchburg, Poplar Forest. Overwhelmed by visitors at Monticello, Jefferson escaped several times per year to find what he called the “solitude of a hermit” in this home that he designed. While he served as president in 1806, Jefferson directed the masons in laying the foundation for this dwelling that today is considered one of the most creative and original architectural designs. This octagonal home is located in Bedford County, and it demonstrates Jefferson’s mature skills in architecture and landscape design. The public was first treated to this home in 1986, and awrd-winning restoration continues on the home’s interior. Archaeologists explore the grounds for clues about Jefferson’s ornamental landscape and plantation community. Poplar Forest remained a private property until 1984. When it became endangered, a nonprofit group formed to rescue the home for educational and cultural benefit for the public. 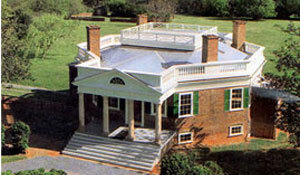 Now, Poplar Forest is a National Historic Landmark and a Virginia Historic Landmark. A great time to visit is on the anniversary of Jefferson’s death, or the 4th of July. On that day you can enjoy local crafts, a tour of the home and museum, and local re-enactments of various portions of early nineteenth-century Virginia traditions. DIRECTIONS: Take U.S. 221 or U.S. 460 (avoid business routes) to Route 811. Turn onto Route 661 (Bateman Bridge Rd.). Entrance is one mile on right. Buses enter via Foxhall Dr. To leave, use rear drive and turn right onto Foxhall Dr. Follow signs to 221 and 460. Poplar Forest is open daily 10-4 from April through November, including all holidays except Thanksgiving. The last tour begins at 4pm. Group tours year-round by appointment. Admission is reasonable for adults, seniors, youths, and under 6.